Passing through the UAE on a layover with a few hours to spare? Travel writer Jaime Morrison Curtis makes a quick list of Abu Dhabi happenings so that you can make quick work of it when you find yourself in the Emirates' capital city. ABU DHABI – Like many major cities, Abu Dhabi acts as a hub for tens of thousands of travelers connecting east to west and north to south every year. One thing that makes the transfer port unique is the unusually long layover times most travelers will experience. Whether their final destination is an Asian city or a tiny island in the Indian Ocean, travelers are likely to find themselves with anywhere from a six- to 24-hour layover in Abu Dhabi. 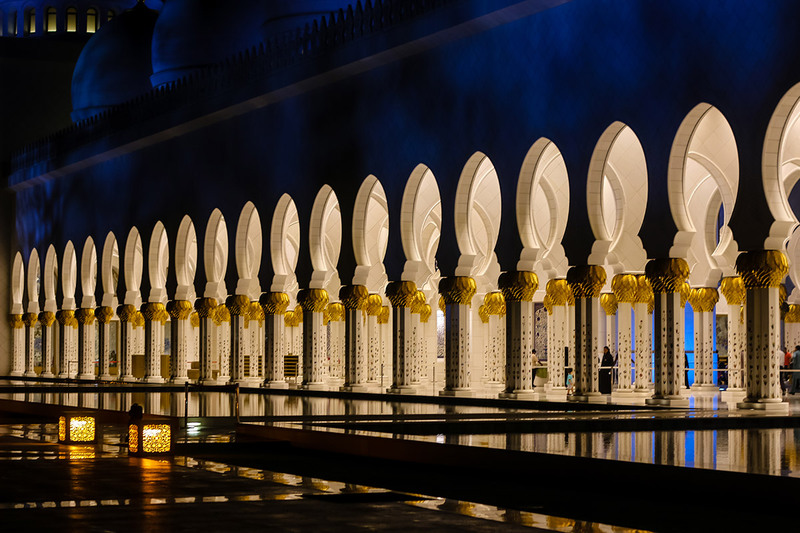 Consider it an opportunity to experience the UAE's stunning Arabian architecture and wonderful hospitality. Home base: Shangri La Abu Dhabi. 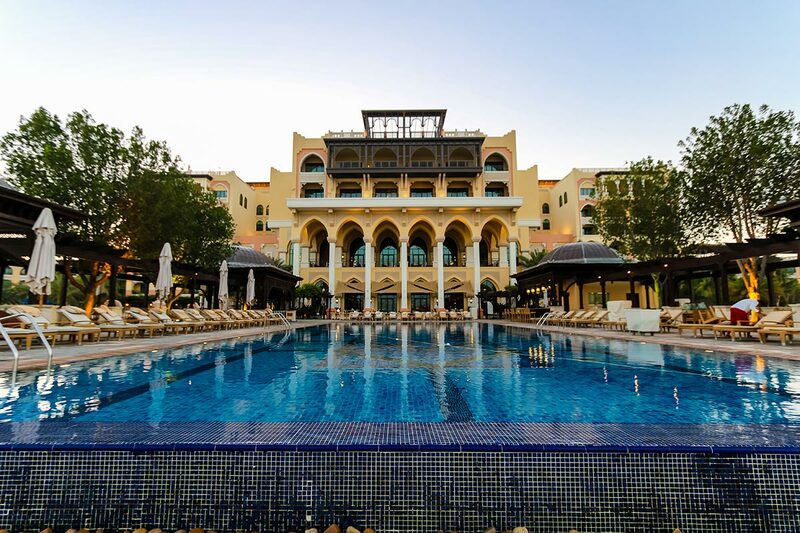 A pool and private beach at Shangri La Abu Dhabi. Though Abu Dhabi airport was the first to offer luxury sleeping pods (, Terminal 3), there are other options for really stretching out after a long flight. Grand Canal is about ten minutes from the airport and has plenty to do nearby to get the most out of a short stay. For a luxurious taste of Arabic hospitality, book a room at for private beaches, pools, spa, and spectacular views of the stunning Sheikh Zayed Grand Mosque Center. Budget-friendly but still luxurious is the neighboring . 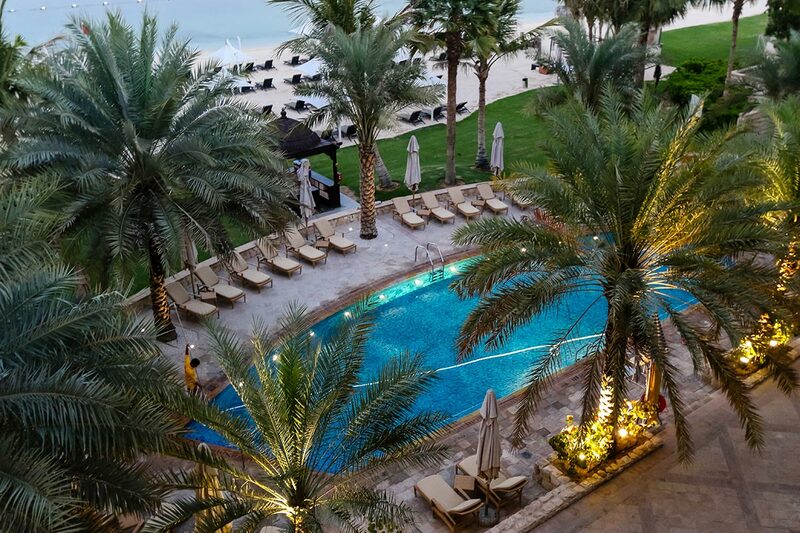 Bright and contemporary, the hotel has a private beach along the gulf and access to all of the same luxuries from the Qaryat Al Beri complex as the Shangri La. Those with travel points saved up should use them to book a room at a similarly high-end spot like or the . A visit to the is a must. While the view from the hotel room is stunning enough, the complex is worth seeing up close. 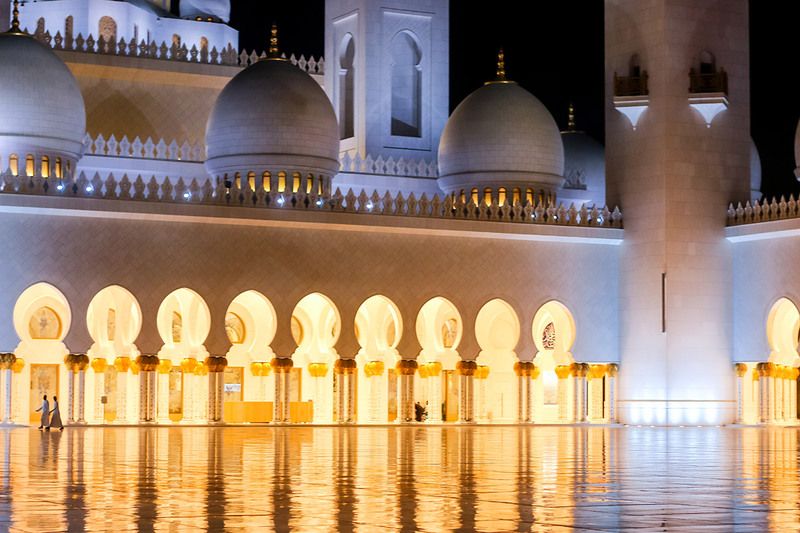 The mosque is just across the water and is an architectural experience that is even more majestic at night, making it perfect for layovers. (Closing time is 10 p.m.) There are signs for self-guided walks and free, 45-minute guided tours in English or Arabic. Visitors have to wear modest Arabic dress or borrow a free abaya on-site to enter the mosque. There are six perfumeries and three shops selling beautiful abayas in , which is accessible from Khor Al Maqtaa by traditional abra boat. After shopping, get traditional Arabic coffee (no visit to the United Arab Emirates would be complete without it) at the sophisticated Finyaal (Bain Al Jeserain, West Maqta; +2-444-5919), a favorite of locals and tourists alike. Falconry is an Emirati tradition dating back to antiquity. is six kilometers from the airport and offers a two-hour guided Falcon World Tour that covers the heritage and history of falconry in the UAE, giving visitors the option to see the majestic birds in flight and to hold them. Emiratis are passionate about luxury cars — Formula 1 car racing, in particular. In November, Abu Dhabi hosts the and the city goes wild. For a taste of the passion year-round, visit on , about 30 minutes from the airport, where you can watch the action on the track or drive a Formula 1 car for yourself. Also on Yas Island is the famous , a theme park which offers twenty thrill rides that you may or may not be in the mood for after your long flight. Just twenty minutes from the airport is , a man-made island where you can enjoy the peaceful gulf waters at the . Purchase a day pass to enjoy the seaside, saunas, and a beachside pool. In 2017, Saadiyat will unveil and . Amazing. Fill up on delicacies at the souq-style buffet at , which is truly the most luxurious selection of live cooking stations you are likely to experience. There's Emirati, Iranian, Moroccan, Indian, and Asian food (from unlimited lobster to fresh fusion sushi to hot curries) that gives you a peek into the spices, aromas, and flavors that define Middle Eastern cuisine. Sample the delectable preparations of local dates at the end of your meal. 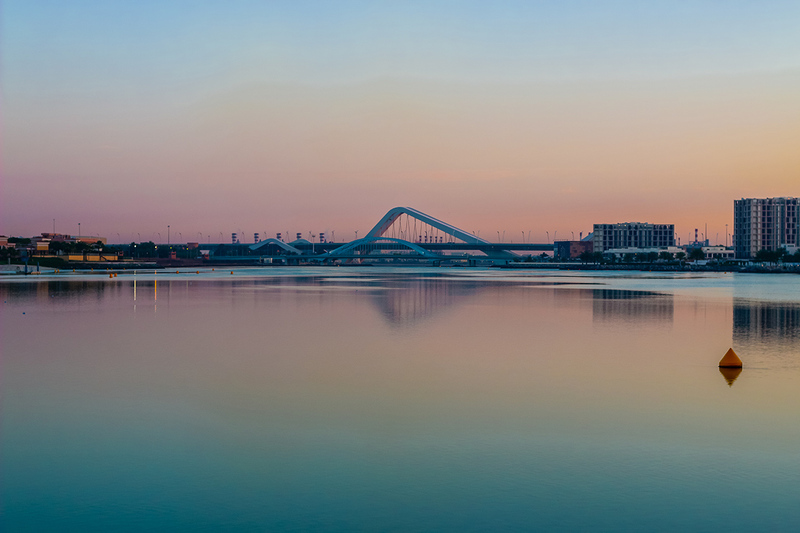 Sunrise views from Shangri La Abu Dhabi. If you're flying business or first class, you can book the free chauffeur service in advance of your flight. Otherwise, work with your hotel to pre-arrange (and pre-pay) a transfer from the airport, or grab a taxi at the always-bustling (even in the wee hours of the morning) taxi stand. 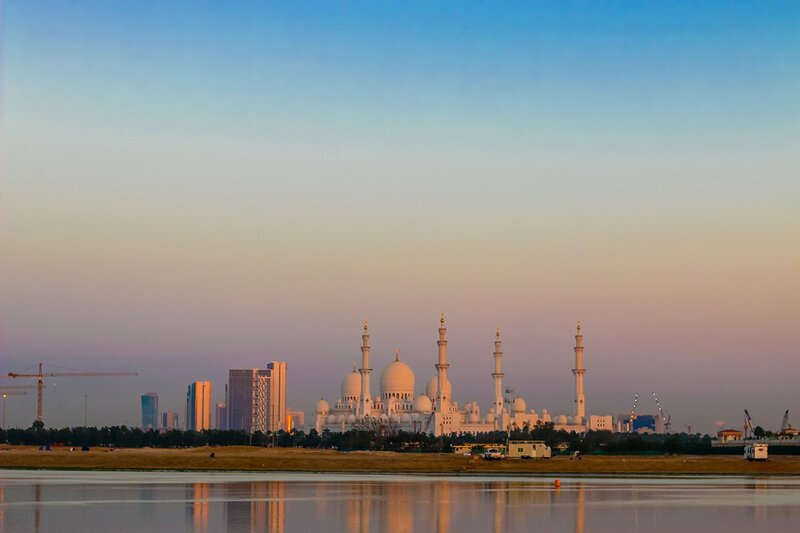 The Grand Canal, mosque, and other destinations are an drive (10-20 minutes) from Abu Dhabi International Airport (AUH), and one-way fares run about USD $12-$20. Taxis in the U.A.E. accept cash only (Arab Emirates Dirham), so make sure to check the current exchange rate and withdraw some at an airport ATM. Note that almost everyone you meet will speak English and be more than happy to help you on your journey. Jaime is an author, travel writer, and born and bred Angeleno. You can follow her on Instagram . She travels to get lost and then found. And to eat all the croissants.